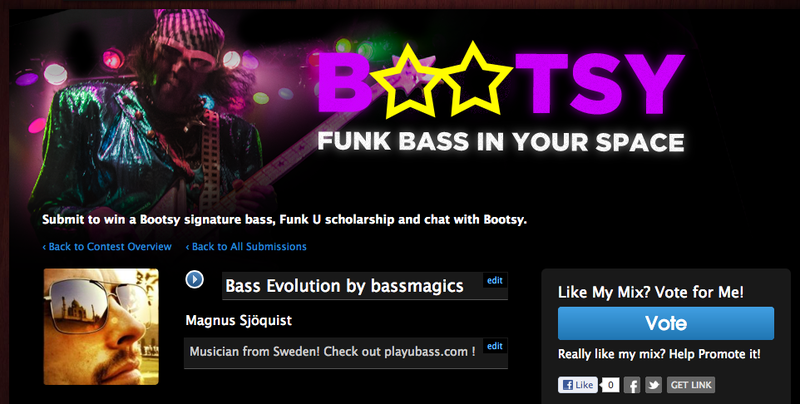 Magnus Sjöquist’s Submission in Bootsy Collins: Funk Bass In Your Space Competition! – Play UBass! Magnus Sjöquist’s Submission in Bootsy Collins: Funk Bass In Your Space Competition! Click the link below, listen and them please vote for me! Magnus Sjöquist’s Submission in Bootsy Collins: Funk Bass In Your Space Competition. Postat i Audio clip, Jammin' with my Kala UBass! Just tried the link and it worked. you can find me there! Pingback: I won one of the popular vote prizes in the Bootsy competition :-) | Play UBass!